Get out and explore the wild Canadian Arctic then come home each day to your comfortable base at the Arctic Watch Wilderness Lodge. The world’s most northerly and remote lodge is situated on the northern tip of Somerset Island, which is a world-class beluga whale observation site. On this eight-day adventure you’ll get the full Arctic safari experience, with guided activities and extraordinary wildlife sightings conducted in 24-hour daylight. 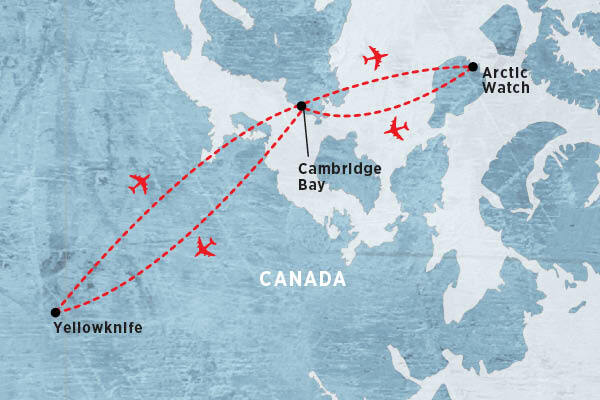 After an overnight stay in Yellowknife, you’ll be flown to Somerset Island in Nunavut and transferred to the lodge. Each day brings the chance of new wildlife sightings, including beluga whales, ringed seals, polar bears, roaming musk oxen, Arctic foxes, snowy owls and more. Learn to drive all-terrain vehicles, try your hand at kayaking among icebergs, navigate the gentle Cunningham River rapids on a raft and fish for Arctic char at Inukshuk Lake. You can also explore the shorelines and canyons on hikes to Triple Waterfalls, Kayak Falls and the Badlands. The Cunningham River estuary is a beluga whale migration site and it’s so close to the lodge that you can see them from the riverbank. Come home with a memory card full of unique photos and a lifetime of stories about your time in the Canadian Arctic.